Bossier is home to a growing community and bustling job market. And it’s those people in the day to day jobs who make the economy run. So let’s meet the people who love their jobs in Bossier. 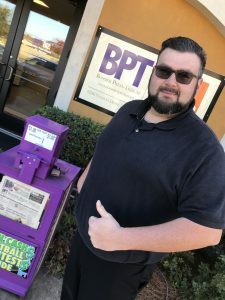 Chris Sepeda, 35, has been an account executive for the Bossier Press-Tribune for 2.5 years. He describes his job as building relationships with small businesses to help them get their name out, or keep their name in the market through sales. Chris is a life-long Bossier resident. A 2001 Benton High School graduate, he currently lives in Princeton with is wife, Kimberly, three kids – Kenley, Cassidy, Sean – and two rescue pit bulls. When he’s not at work, he can usually be found having dinner in the East Bank District, and his hobbies includes playing dek hockey, watching the Mudbugs and coaching girls middle school soccer. 1. In your own words, what do you do? I help small businesses grow because they are the backbone of the community. When I have an idea and they buy in, it lets me see my ideas are valid, but it also gives those businesses valuable tools to use in the future. 2. Why did you want to do sales for a living? I watched my father in real estate interact with people and he made their dreams come true. I knew that I wanted to follow in his steps. I found an avenue where I could do something similar by watching these small businesses grow through marketing and promotions. 3. What is your favorite thing about what you do? Helping small businesses be a success and getting to meet new people. I’ve met new people, became friends with them and now I shop, eat, or use their businesses, not only because they support me, but because I am invested in them and I want to do my small part for them to be successful. 4. Is there an anecdote that you like to remember? When my dad passed away, my boss, Randy, told me not to come back to work. I had a whole week to help my mom and grieve. It let me know that I’m not just an employee but someone they care about. It made me feel like this is a family and I’m valued. It meant a lot to see people from work, who have never met my dad, come to his funeral to support me and my family. 5. 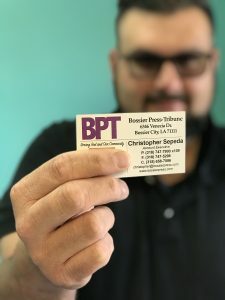 What does the BPT do for its employees that makes you feel appreciated? Constant pats on the back when we reach our goals and the motivation to keep improving. We all work closely together and even though we get on each other’s nerves sometimes, we all celebrate each other’s successes together like it’s our own. 6. Is there anything about the culture or benefits of your position that sets it apart from previous jobs? The freedom to make the call. They believe that I can make important decisions that benefit both the customer and the company. I have never had that before, usually the companies I worked for treated me like I couldn’t be trusted. 7. What would you want other people to know about your workplace? Two things: One, it’s not as easy as everyone thinks. People think sales is easy, that you can just walk in with your product and they’ll buy it. It takes confidence, knowledge and the ability to pay attention to what the person is saying so you can benefit them over yourself. And two, people think newspapers are dying and we’re not because we’re hyper local. I hear all the time how people love that we cover a wide variety of things happening in Bossier Parish. I have people stop me at local sporting events, and even at an LSU game in Baton Rouge, to tell me how much they appreciate what we do. 8. What do you like about Bossier’s business community? It’s ever-growing and changing. The small business community supports itself and likes to help schools, nonprofits, and people in need. I think that speaks volumes about how much the business community cares about Bossier. Want to read more about people that are lovin’ their job in Bossier? Check out last month’s blog on Stephanie Ringgold at Orr Nissan.